The newly launched GMT-Master II “Batman” and Yacht-Master 42 show Rolex at its most subtle, but the Rolex Day-Date 36 “Rainbow” launched at the same Baselworld is on the opposite end of the spectrum. 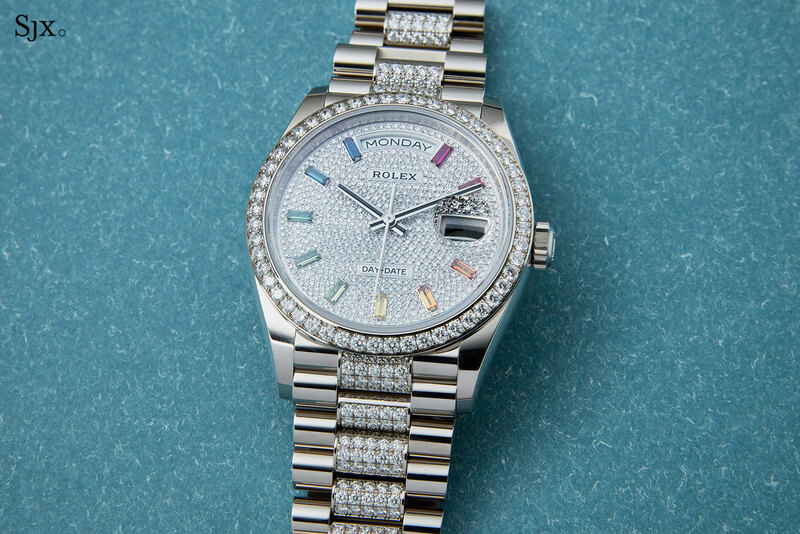 The new Day-Date is the latest addition to the “rainbow” timepieces that have come to define Rolex’s jewelled watches. Though the Cosmograph Daytona “rainbow” is the best known and most sought after Rolex with a multicoloured gemstone bezel, the Geneva watchmaker has been making “rainbow” Day-Dates since the 1970s. 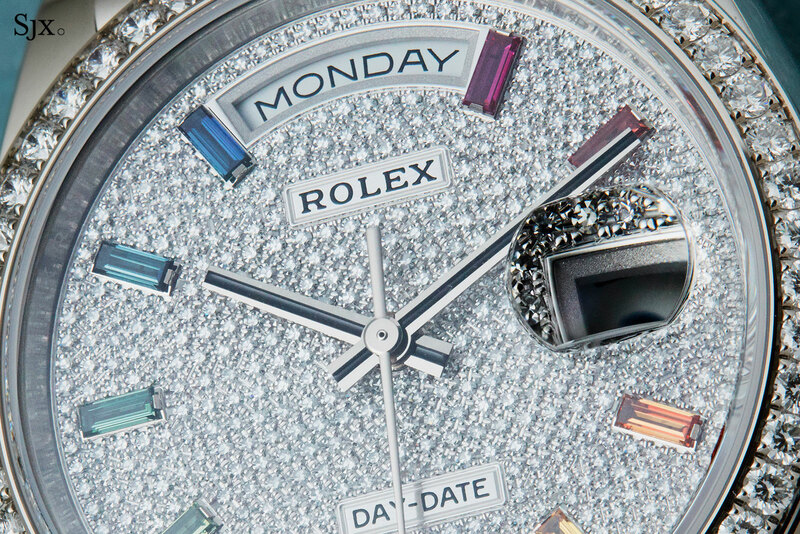 The new Day-Date 36 “Rainbow” takes after those, albeit in a simpler style, with 12 rainbow-colour sapphires for the hour markers, instead of being set on the bezel as it was in the past. Available in rose, yellow, or white gold, the case is 36mm in diameter, the original Day-Date case size but smaller than the Day-Date 40 that’s now the largest of the line. 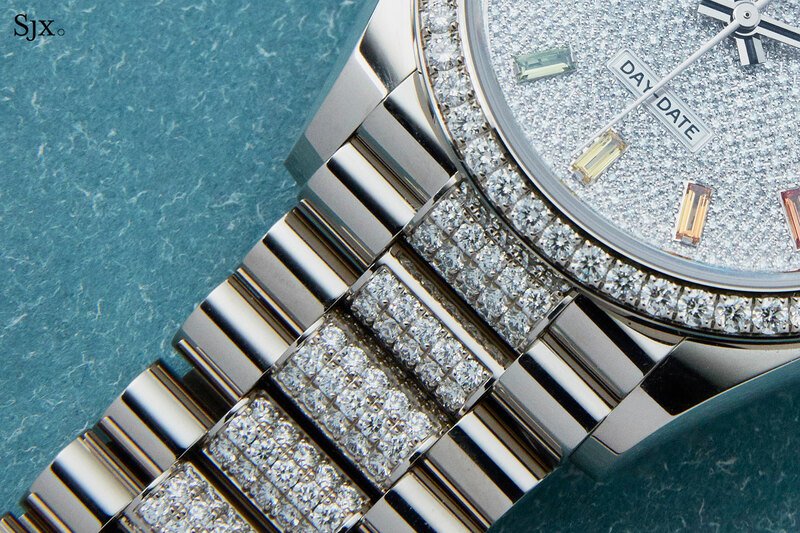 The bezel, dial, and bracelet are paved with brilliant-cut diamonds. The look is over the top but exactly the look the target audience of such a watch wants. That being said, the brilliant-cut diamonds feel like a slight step down from baguettes (yes, it’s a first world problem), which also explains why this is relatively affordable as such things go. That being said, the watch is also available with a plain gold bracelet without diamonds, and also with a fluted bezel instead of the diamond-set bezel. Though the average buyer of such a watch will not care, the movement inside is the cal. 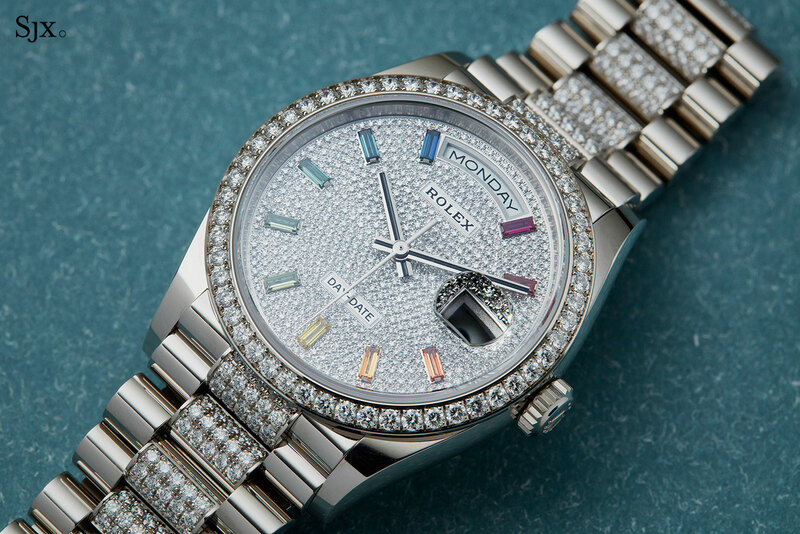 3255, one of the latest generation of Rolex movements that has all the innovations of recent years. The patents within the movement total 14, which give it better timekeeping and a longer power reserve of 70 hours. The Day-Date 36 “rainbow” is available in Everose gold (ref. 128345RBR), white gold (ref. 128349RBR), and yellow gold (ref. 128348RBR). The Everose and white gold versions cost 121,100 Swiss francs; the yellow gold model costs is unavailable but it is slightly less. Multi-coloured gemstones are back on the Cosmograph.